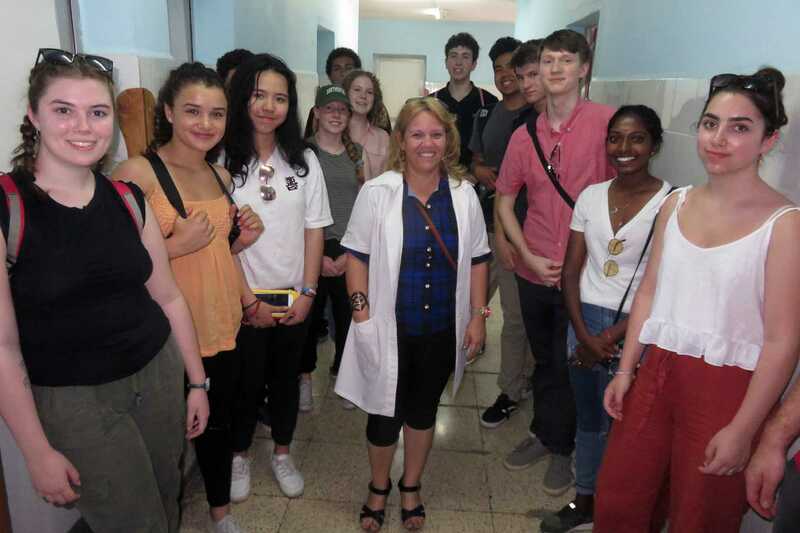 A group of Northwest School students and faculty are spending two weeks in Cuba on a cultural and language immersive program. It is the first time in 16 years NWS has traveled to the country. We will update this blog post with messages from our students as they arrive. After finishing our last language class, we all said our farewells to our teachers, María del Carmen, Roberto Delgado and Lily, who had welcomed our group into the school with open arms and a fiery passion to further our Spanish abilities. Although we ran out of time for dancing Salsa as María had promised us she still ended class with an intense and wise speech on the importance of studying and valuing our time as students and privilege to learn. Maria even shared with us her email so that we can continue to communicate with her when we return to the US. To show our appreciation and further the NWS culture we presented them with 3 beautifully hand-written letters (in Spanish of course) featuring sketches of Seattle features. 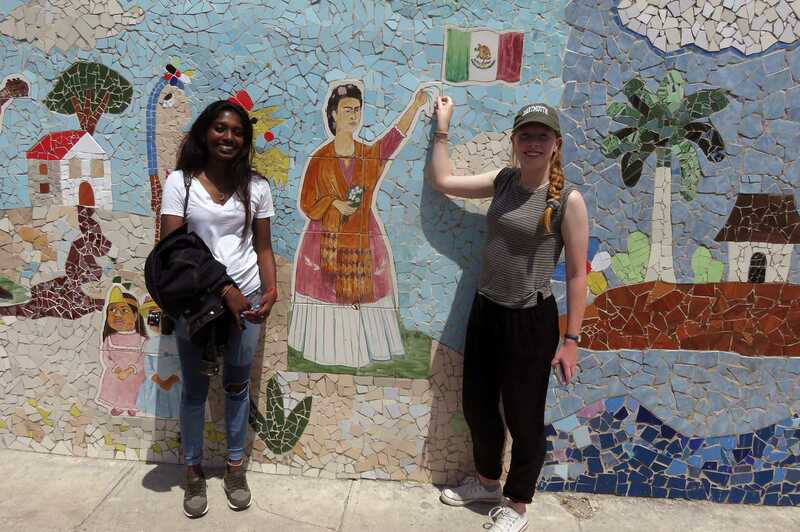 We then made our way from the Centro de Idiomas Jose Martí to lunch at the paladar (a privately owned restaurant) El Jardín de los Milagros (the Garden of Miracles) and were immediately treated to a flower-covered stairway leading to the semi-outdoor dining area on the second floor. We enjoyed the beautiful space with a meal of non-alcoholic mojitos and an assortment of Cuban dishes. Upon finishing, the owners, Guillermo and Tatiana (who are trained professionals – he a civil engineer and she an electrical engineer) told us that the paladar was founded seven years ago and the floor we were on was added two years ago. Behind the dining area was a multi-platform garden, growing plants that the cooks used in their meals and reducing the paladar’s environmental footprint. Along one wall next to our tables were a dozen wooden beehives, populated by non-stinging bees. Abel pointed out that there was always one bee guarding the entrance to the hive, making sure no one came in “without the right passport”. After giving the staff our muchas gracias, we continued to the Museo Nacional de Bellas Artes de Cuba. Along the way, we made a quick stop at Parque John Lennon, famous for its statue of John Lennon sitting on a bench. We learned from Abel that John’s iconic glasses were stolen so frequently that the city hired someone to keep the glasses with them at the park and put them on John when tourists come to take pictures. The park was unfortunately absent of said employee, but we had fun taking some shots with glasses-free John. After lunch, we headed to the famous Museo Nacional de Bellas Artes de Cuba, a museum of visual arts which holds the works of many famous Cuban painters, including Wifredo Lam. Most of the Cuban artists whose works we viewed also have pieces in world famous museums such as MOMA, the Reina Sofía in Madrid and the Louvre. Although we were not able to take pictures of any of the artwork that we saw each piece was memorable and undoubtedly thought provoking. 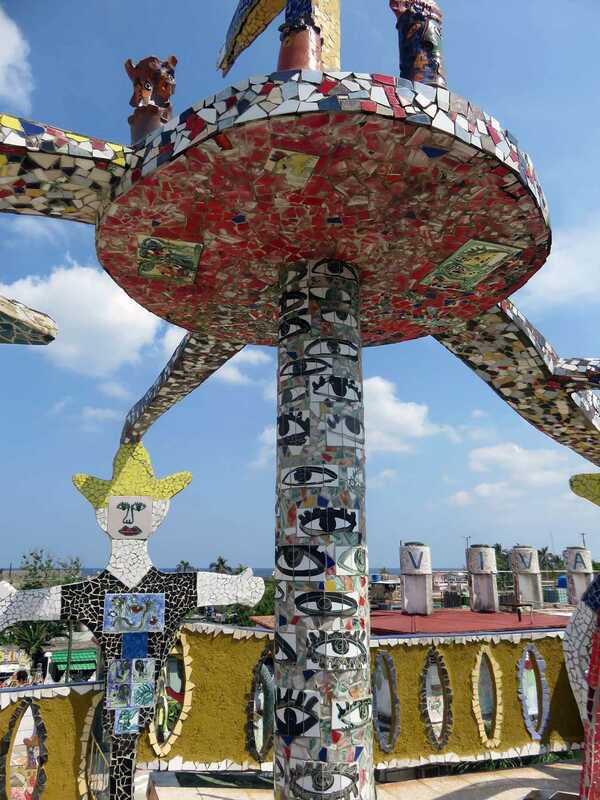 Each level of the museum displayed different artists who are all famous for their focus on different aspects of Cuban culture, history, and society. With each level, we were presented with the unique ways that each artists views Cuba and how their work has influenced the country while also sticking to the country’s historical background. With the bit of down time we had afterwards at the hotel some of us rested, others used internet, and a small group decided to walk the Malacón which is the long sidewalk promenade that runs along the Atlantic Ocean for miles. For dinner we all met punctually at 6:40 and headed to our farewell dinner at the paladar ‘Elite’. We plan to end our last night in Cuba by going to a jazz music venue, conveniently located just across the street from our hotel, featuring local musicians and groups. After that we’ll head back to catch a good night’s sleep in order to be well rested for the upcoming day of travel tomorrow. - Mosey B. and Isaac R.
On our way to language classes today we had an exciting standoff with a municipal garbage truck in one of the narrow one-way streets of Havana. The truck was driving the wrong way down the road, but even when the driver saw us coming, he kept going toward us (slowly). Danilo, our bus driver, got out of the bus to go talk to the guy and give him a piece of his mind, and was soon joined by our tour guide, Abel. They successfully backed the truck up (through an intersection?) and were welcomed back onto the bus with a big round of applause. Something we found interesting about this was how peacefully it was resolved, which might not have happened in the gun-crazed United States. After language classes, we headed to lunch at Sloppy Joe’s, a historic restaurant. On the way, we discussed US-Cuba relations throughout history, and, more specifically, the trade embargo. Abel pointed out a really fascinating flaw in the justification used by the US government about preventing the spread of communism, considering the fact that the US has normal relations with other communist countries (e.g., China and Vietnam). He also explained to us just how pervasive and damaging the effects of the embargo have been on Cuban society. For example, Cuba’s access to internet and cable is extraordinarily limited because the expected providers (neighboring countries) have certain connections with the US that, according to the US government, prevents these countries from engaging in trade/connection with Cuba, but even more importantly, many people have died unnecessarily given the embargo on medicine and medical equipment. 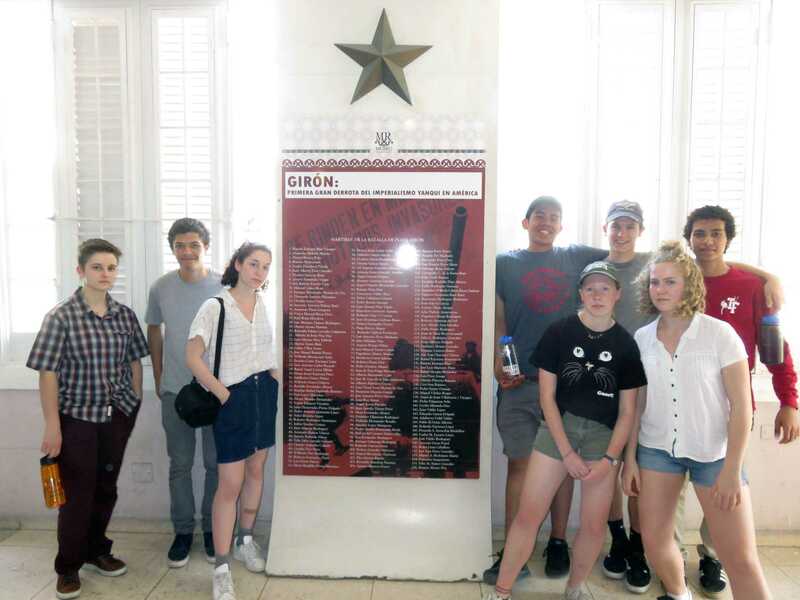 After a delicious lunch, we went to the Museum of the Revolution, located in the palace of the former Cuban President and Dictator Fulgencio Batista. One of the first things we saw was preserved bullet holes in the wall from an assassination attempt on Batista in 1957 conducted by students from the University of Havana. We saw Batista’s office, which has been kept the same as it was when he was in power. There was a gold telephone in the corner of the room, the replica of which was used in a scene in The Godfather 2! We also saw the meeting room for the Council of Ministers. In it was an oil painting of the drafting of the first Cuban constitution. Something we noticed was that there was only one woman and two Black people in the painting, all of whom were far from the center of attention. Abel explained that they were there fighting to have their rights represented in the new constitution. 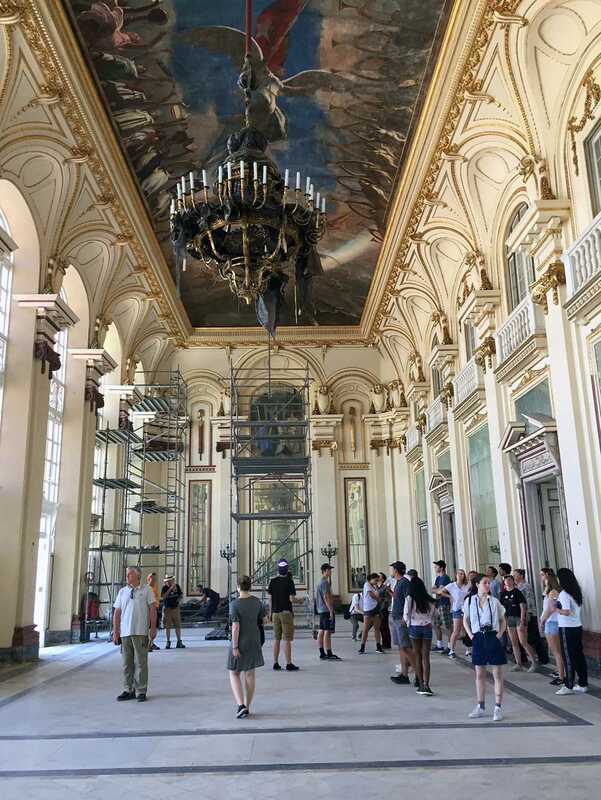 Afterwards we explored several rooms about the Revolution itself and the people and events involved in overthrowing Batista’s regime. There was a specific focus on Fidel Castro, Che Guevara, and Camilo Cienfuegos, the leaders of the Revolution. We were struck by the irony of Batista’s former palace now being used as a tribute to the very people responsible for overthrowing him. We even got to see the boat, Granma, that the revolutionaries used to return to Cuba from Mexico to begin the revolution in December of 1956, as well as other preserved vehicles used not only in the revolution but also in fighting off the CIA-backed Cuban exiles who attempted to overthrow the revolutionary government in the Bay of Pigs fiasco in 1961. Then, we took an ice cream break on the steps of the palace and returned to the hotel for some down time. We just arrived home from a delicious dinner at a farm-to-table paladar called Mediterráneo Havana that specializes in Italian cuisine and fish freshly caught from their own boat. Now it’s time for bed. 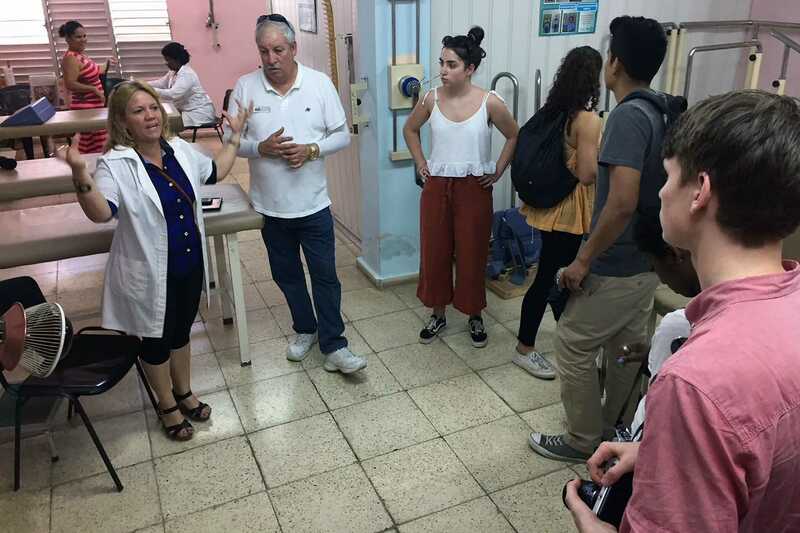 - Liza J. and Stephanie S.
- Megan W. and Savita W.
I learned a lot today about the Cuban medical system. What really made a huge impact on me was understanding that no matter what medical care anyone needed, it was delivered free of charge. I think that it says a lot not only about Cuban political priorities, but also about the hospitality of Cubans in general. I notice that everywhere we have gone people have been very welcoming. Whether it is waiters, hotel workers, or tour guides, everyone has treated our group with so much respect and patience and have even called us their family. Someone who has especially stood out to me as being very hospitable is my Spanish teacher, Roberto Delgado. He is a charismatic guy who is constantly encouraging mistakes in the classroom so that we won’t make mistakes on the street. He does not take offense when we accidentally use tú, the informal word for ‘you’ instead of usted, which is the formal term. Instead he tries to create an environment where everyone is equal and acts as though we are all friends. I think that he has a unique way of teaching which involves making jokes and pushing people out of their comfort zones. Even though our class is two hours long, it feels much shorter and has been fun so far. Tonight, we had the pleasure of going to a French restaurant where I had amazing shrimp with pasta. It was different to not eat rice and beans, but also a refreshing break! Everyone enjoyed the time out of the hotel and are looking forward to our night of card games! We awoke to a dense fog that swallowed the vast Viñales Valley. After breakfast we embarked on our journey. After about an hour and a half of catching up on sleep on the bus ride, we pulled into the beautiful and luscious hills of Las Terrazas, an ecological self-sustaining community. We first arrived at a large lake filled with minnows and aquatic plants. Surrounding the lake are a fraction of the eight million trees that have been planted in Las Terrazas by the Cuban government since 1965. Venturing deeper into the outstretched arms of the community, we found ourselves at a hotel gracefully built around a stunning tree, its branches branching out into the lobby and its trunk traversing the tall expanses of the ceiling. We decided to explore the sprawling landscape by walking through the woods, gazing upon the natural beauty, including Cuba’s national bird, the tocoroco, whose sound Andrew mimicked flawlessly. We conveniently emerged from the woods at our lunch spot, ecstatic to feast upon a delightful assortment of Cuban delicacies, such as local fruits and the standard rice, beans, and meat. While eating, we noticed a lack of fugitives taking refuge in the trees and learned that this close-knit community had no need of a police force. Instead, they focus their energy on maintaining their tourist draw, fueling their main source of income. We made our way to a small coffee shop, where we enjoyed a staple of Cuban culture. The rich blend of flavors and the marvelous view from the café put Starbucks to shame. As we walked to the studio of a local artist, we noticed the abundance of gleaming solar panels lining the houses. After inquiring on this observation, our beautiful guide, Abel, enlightened us to the national goal of providing over 30% of all energy in Cuba by the glorious, impenetrable luminosity of our Sun. We finally made it to the studio of Lester Campa, a prominent Cuban artist, who has met His Eminence, Fidel Castro, when he visited Campa’s studio to admire his creative paintings. He welcomed us into his studio, opening his heart and mind to us, telling us about the sacrifices he made to become the artist he is today, notably, leaving his family at age twelve to go to an art institute. We were all enchanted by his art and the hidden meanings in every piece. At our final stop in Las Terrazas, we visited the remains of an old coffee plantation. We witnessed the horrifically small slave quarters, each packed full with ten people, each working 16 hours a day in the hot sun. Tired yet fulfilled, we found our way back to the sun kissed and ocean sprayed Habana Riviera Hotel. - Peter G. and Xavier D.
Today in Viñales, a picturesque small town in Pinar del Río province west of Havana, we started our morning with a three-mile hike in the Viñales Valley. A local guide, Tito, guided us through the farms of his neighborhood, while pointing out the variety of flowers, plants, and animals. Also, he expressed the significance of the architecture in regards to climate in Cuba. In addition to his vast knowledge, he shared with us important information about Cuban culture in the “campo” (country). Another thing he taught us was how seasonally dependent agriculture in Cuba is, specifically rice. Following our morning hike we had a delicious lunch accompanied by Cuban music looking out at the historic, painted limestones. After lunch we took the bus to a cave in the mountains, with a river running through. We explored the ancient caves while marveling at the stalactites. Following this adventure, we took a stroll through the market in downtown Viñales. The experience of talking and interacting with the vendors, was helpful to practice our Spanish and allowed for conversation. We ended our day by playing ultimate frisbee in the pool and enjoying a Cuban buffet style dinner. - Olivia K. and Mikaela L.
Upon reflection, I think that I drew the most out of my experience on the hike with Tito; I gained insight on how valuable the agriculture industry is to the livelihood of many Cubans. I also enjoyed conversing with Tito about his family, and listening to his jokes. Hearing about the culture, and the interesting habits in his daily life really put the U.S. culture that I am so accustomed to into perspective. On another note, I really enjoyed talking to vendors in the market about their products and talking about where we’re from in the U.S. I like getting to know the group better and having conversations with everyone about what we did in any given day; it’s helpful to process what we learned by hearing different perspectives. I’m very glad we got visit Viñales, and I’m excited to learn more about Cuba! Day four came with many moments of insight, humor, and knowledge. Not only was it the first hike I have gone on where halfway along the route at a little rest stop I was graciously served a piña colada (the only two ingredients were a super-sweet pineapple and a fresh coconut grown on the premises), but it was my first river ride through a cave, my first lunch trying mandioca (which Cubans call yuca), and my first day in Viñales. On our walk, Profe Daniel explained to me the interesting fact that Cuba is a subtropical island rather then a tropical island. While looking out at our view from the balcony and the windows from the bus, there is something extra beautiful about being in a place that reminds you of home but at the same time could not be more different from our evergreen state. The lushness, the green, the tall trees, and the mountains remind me of our beloved state, while the limestone rocks, palm trees, coconut stands, and constant sun remind me of the excitement of being in a new place. Throughout our beginning moments in Cuba, I have already witnessed the beauty of the country, and am so excited for the sights to come. Today we started early at 7:45 to be at our second session of language classes by 9:00. We divided up into three classes representing different language levels. The instructor for our level was named María del Carmen. She was very enthusiastic and engaged in class. We also shared class with people from other countries as well. Following our language classes, we drove to lunch. On our way, we drove by a famous art school, the ISA (Instituto Superior de Arte), and by many mansions and ambassador’s homes. It was interesting to see the extreme differences in sizes of homes from other parts of Havana, and to see the architecture. We then had lunch at a place deeply involved in the community that supports young local musicians and singer-songwriters. We ate lunch in a large, open air space on the premises of the arts center. We then got on the bus to go to our next destination, Viñales, located in the province of Pinar del Río, the westernmost part of Cuba. On our way, we stopped at small that sold organic fruits and vegetables native grown in the immediate area. Abel, our guide, bought some Guanabana for us to try. We made another stop at the Soroa Orchidarium botanical garden that specializes in the preservation of orchid species. Among the all the flowers there was one of the national trees, the royal palm, and were invited by our guide, a trained botanist, to eat a sour fruit called a “pepinillo,” which means “little pickle.” These fruits grow straight out of the trunk of the tree! We got to walk around a huge brick house where a former governor of province, the owner of the garden, had once lived. We left the garden and made another stop at a family owned tobacco farm where they told us how they planted, harvested and prepared tobacco for cigars. The tobacco industry is a huge part of the economy in this part of Cuba. We drove for a bit more and arrived at the bright pink Hotel Horizontes Los Jazmines that is set on the side of a small hill overlooking the beautiful limestone mountains of Viñales. We then ate dinner at the hotel and got ready for the next day of fun in the countryside. -Andrew S. and Tamrat H.
In the morning, we had our first language class at the Jose Martí Language School from 10am-12pm. Our teacher, Roberto Delgado, is an amazing and charismatic teacher who likes to tell lots of jokes! We spent the two hours all together going over the basics of using “usted” and introducing yourself to people. It was very good review and it was fun to learn all together. Lunch at ‘La Mina’ restaurant had options of beef, chicken and fish. Instead of fancy, it was more like a local restaurant where tourists can feel what locals’ meals are usually like. For lunch, ice cream and coffee are provided after main dish, and the ice cream we had throughout the trip were all tasty. After lunch, we visited Cathedral Square, Plaza de Armas, San Francisco Square and Plaza Vieja. During the tour about squares, we saw crumbling buildings, buildings in recovery and restored buildings. The way Cuba deals with crumbling buildings is to keep the history but also save the building. It was also interesting to explore small shops in the squares and enjoy the music there. Then, we explored a handicraft market, where you can purchase things from local artisans. After dinner at a small, fancy restaurant in Old Havana, we went to La Fabrica de Arte, an old factory building that has been turned into a hub for Cuban youth. It was the most memorable part of the day for me because there was so much going on! There was a bar/club scene in the front, an extensive modern art gallery upstairs, and multiple music concerts all going on at the same time! The whole building was like a maze with different kinds of people and different happenings in each room. My favorite part was probably listening to a classical music concert that was happening in the back of the building. The orchestra was comprised of classical instruments, but their music was very edgy and modern. As a musician who kind of looks down on classical music as boring and monotone, I was really happy to hear how you can use those same instruments to make something innovative and creative. - Xiaojun L. and Allegra M.
Our first day in Cuba, we got off the plane and moved quickly through immigration. We were met by our guide Abel just inside the airport and followed him outside into the sun. Abel introduced us to our bus driver Danilo, who took us to the Plaza de la Revolución on our way to the Hotel Riviera. In the Plaza, the focus was on a massive monument to Jose Martí, one of Cuba’s national heroes, where Fidel Castro gave many of his hours-long speeches. Directly across from the monument were two buildings which had outlined facades of the faces of Che Guevara and Camilo Cienfuegos. There was a third building with a blank face, and Abel told us that it was supposed to have a façade of the face of Fidel Castro, but that Fidel had told his brother Raul upon his death that he did not want images of himself spread everywhere around the country. It was surprising to me that Fidel didn’t want images of himself around the country after all that he had done for the country. Afterward we got back in the bus and drove to our hotel. Our hotel is right next to the Malecon, a sea wall that protects the edges of Cuba from flooding. We all got settled in and then we went to a market to buy bottled water. Then we went to dinner at El Aljibe, a third-generation family owned restaurant. We ate roast chicken, rice, and beans. While we ate, a musician played Guantanamera and some other amazing songs. - Lexi R. and Lucy M.